But it’s not so simple. 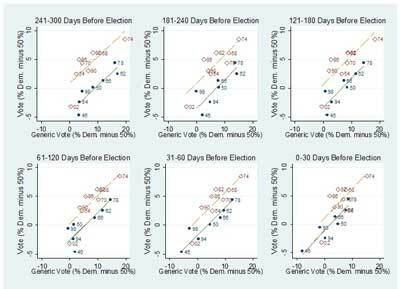 In research published a couple years ago, Joe Bafumi, Bob Erikson, and Chris Wlezien found that, yes, generic party ballots are highly predictive of House voting–especially in the month or two before the election-but that early polling can be improved by adjusting for political conditions. 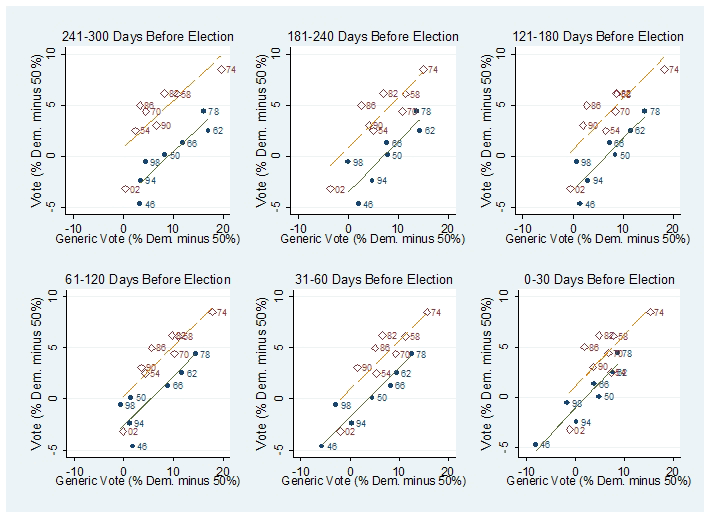 In particular, the out-party consistently outperforms the generic polls. The paper accompanying this graph was among the first public predictions of a Democratic takeover in 2006. Bafumi, Erikson, and Wlezien’s analysis doesn’t go back before 300 days before the election, but if we take the liberty of extrapolating . . . The current state of the generic polls gives the Democrats .412/(.412+.377) = 52% of the two-party vote. Going to the graph, we see, first, that 52% for the Democrats is near historic lows (comparable to 1946, 1994, and 1998) and that the expected Democratic vote–given that their party holds the White House–is around -3%, or a 53-47 popular vote win for the Republicans. Would 53% of the popular vote be enough for the Republicans to win a House majority? A quick look, based on my analysis with John Kastellec and Jamie Chandler of seats and votes in Congress, suggests yes. It’s still early–and there’s a lot of scatter in those scatterplots–but if the generic polls remain this close, the Republican Party looks to be in good shape in the 2010. P.S. Is there any hope for the Democrats? Sure. Beyond the general uncertainty in prediction, there is the general unpopularity of Republicans; also, it will be year 2 of the presidential term, not year 6 which is historically the really bad year for the incumbent party. Still and all, the numbers now definitely do not look good for the Democrats.